Alicja Barahona, 64, runs extreme ultramarathons. ABC News’ latest short documentary, Ice Runner, follows Barahona as she takes on a marathon across the frozen waters of the world’s deepest lake, Siberia’s Lake Baikal in Russia. The following text is written from her point of view. Opinions expressed in this column do not necessarily reflect the views of ABC News. My name is Alicja Barahona, I am a woman in my mid-60s and I live in Westchester County, NY and for the past twenty years my hobby has been running extreme ultra marathons. Extreme ultramarathons are races of two hundred-miles or longer and always across harsh terrain, often through deserts or mountain ranges and in extreme temperatures. Although I haven't counted how many ultramarathons I've run in, I know its been hundreds. I have run 350 miles along the Iditarod Trail in Alaska three times at -30 degrees Fahrenheit. 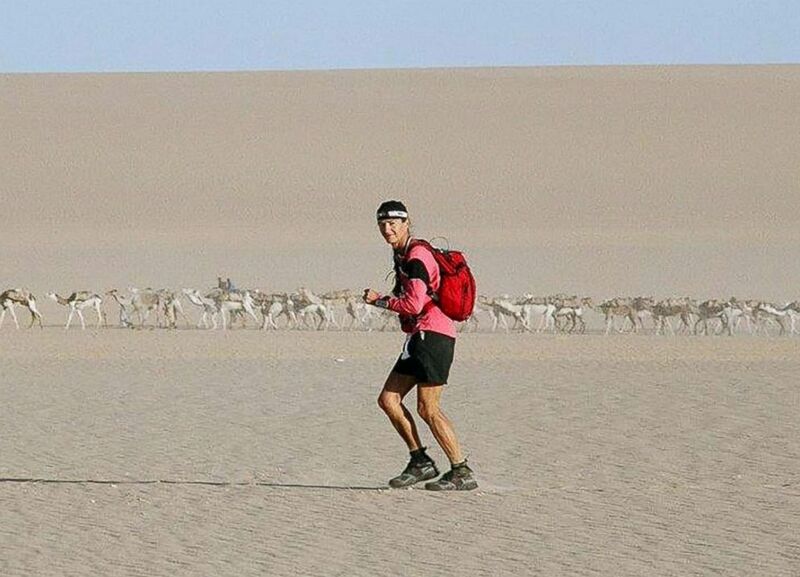 I’ve completed the Trans 333 six times, a 208-mile non-stop race in the Sahara Desert. I ran a 145-mile trail race in the UK three times and I've also run the Marathon des Sables, a 150-mile stage race in Morocco. 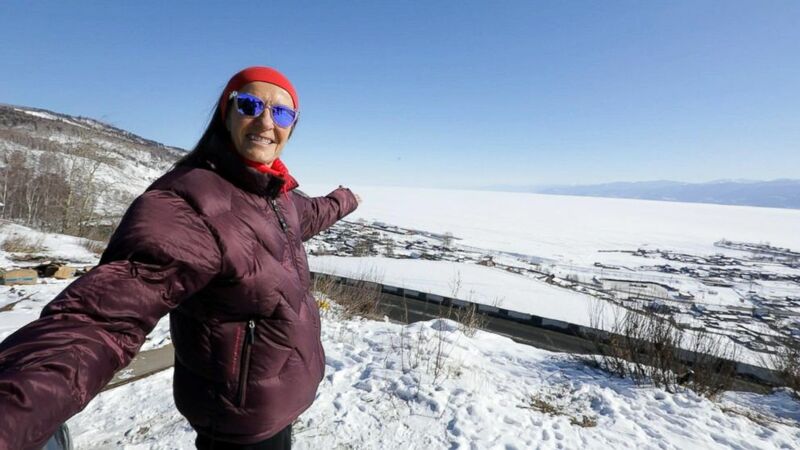 Alicja Barahona smiles for the camera as she prepares to run the Baikal Ice Marathon in Siberia. ABC News followed me on my latest extreme run, the Baikal Ice Marathon, a 26-mile race across the ice over the middle of Lake Baikal, the deepest lake in the world located in Siberia. Running on the lake’s ice in this incredibly place was like no other race I have done. I only started running in my mid-40s. My previous hobby - tennis - had got too complicated (finding a partner, arranging a court, or uncooperative weather). Running, I thought, is a simple sport. As long as you have shoes, shorts, and a T-shirt, you’re ready to go. And so I started. I challenged myself to run one loop around a local high school track in Tarrytown, New York. Within a year, I did my first marathon, the New York City Marathon - and I was hooked. My first ultramarathon was a six hour race in a New York park -- participants ran around a single loop for 6 hours and the winner was whomever accumulated the longest distance. After that I began doing the extremes. My longest race was the Trans 555+, a 400-mile non-stop race across the desert in Niger, Africa - where you self-navigate with GPS. I don’t keep track of the number of ultramarathons I have run, but if I include all the six, 12, 24-hour and 50 kilometer races (which I use as my training races) it is now into the hundreds. The extreme races are very challenging and can be very dangerous. First, you have to keep focus and keep on-course - it is easy to get lost in a snowstorm, or if a GPS runs out of batteries. Second, you have to pay attention to your body. In a remote area nobody is around for miles so you can depend solely on yourself. Alicja Barahona runs the Baikal Ice Marathon on Lake Baikal, the deepest lake in the world. In the Canadian Arctic, I almost froze to death when my sled broke and I stopped to fix it. Even with the proper clothes, I quickly got very cold. I began to get this warm and fuzzy feeling, I just wanted to sit down and rest. Thank God my survival instinct kicked in. I saved myself by starting scream, jumping and even talking to the moon just to keep myself conscious. Another time, in the Sahara Desert, I went ten hours without water. I was in the lead of the race, and the organizers didn’t put a checkpoint with water ahead of me. I thought I would die. 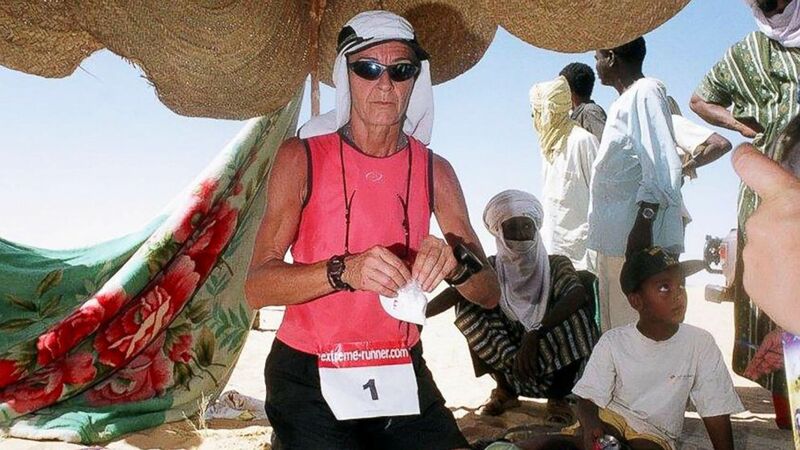 Alicja Barahona runs the 555km ultramarathon in Niger. I started hallucinating: I saw snow on the ground and a parked train with silver water-cisterns. Of course, there was no railroad or even a road there. I was in the middle of the desert at 120 degrees. I have finished races with frostbite; this year at the Baikal marathon my eye was damaged by the ice blown into it by freezing winds. But I always know I can finish a race. I have only pulled out of a race once - from a 350-mile trek due to a salmonella infection. I was 130 miles in and with a four hour lead. "Nothing is difficult or impossible if you have passion and the drive to do it"
From all my running experience, I can tell you that nothing is difficult or impossible if you have passion and the drive to do it. I started running in my mid-40s and I soon became one of the world’s leading female extreme runners, the first-placed women in all the races I ran in the deserts, in Alaska, and in the UK. Sometimes I was even the overall winner! 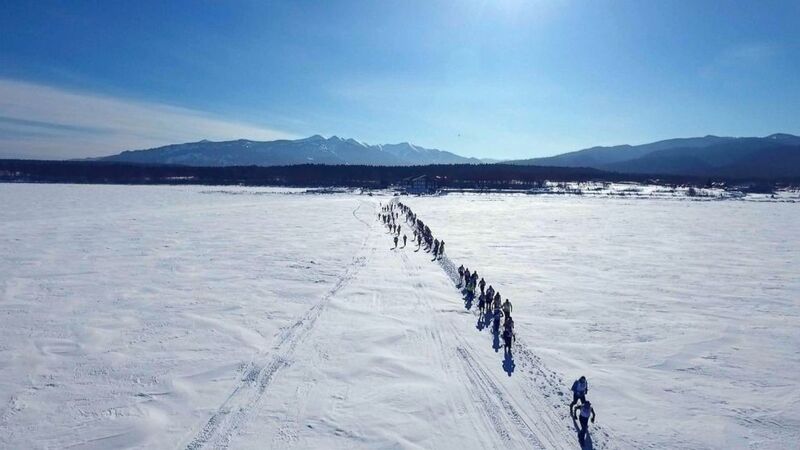 Runners just after the start of the Baikal Ice Marathon on Lake Baikal, the deepest lake in the world. This is not to say that I am a super athlete, only that I loved the challenges; I kept my focus, and searched for my limits. I always strive to do my best. My training regime is not extreme. I work full time for a pharmaceutical company and train mostly on weekends. In a preparation for races in wintery conditions where I have to pull a sled, I run around the neighborhood pulling a tire. In a preparation for desert races, I run on the beaches of Fire Island. I pay for all my travel, equipment, clothing - and lots of pairs of running shoes. I’ve never had a sponsor. I work full-time. Before races over 200 miles, I do a lot of long runs, of up to 130 miles, the month before. My minimum training run is 10 miles and I never train more than five times a week. I don’t have any special diet. I like to eat normal food during races. I don’t like fitness bars. One thing that helps push me is fundraising, which I do for most of my long races. After my neighbor died from Alzheimer's, I did a fundraising run for the Alzheimer's Association. After the Ebola outbreak in Africa, I ran to support Doctors Without Borders. My Baikal run raises money for my local Hudson River Clearwater organization, which helps clean up the Hudson River and educate youngsters on protecting our environment. It is nature and the people I meet that also draw me to these races. Some of my favorite experiences have been seeing the vibrant colors of the sand in Mauritania, witnessing the Northern Lights and howling wolves in Alaska, and caravans carrying salt blocks in Niger. I may even add the hallucinations that come after long days, sleep deprivation, and physical exhaustion. Every race is an incredible story that I share with others. "Go out and do whatever you dream about"
I also get an extra push from others telling me how my unique races have motivated them to overcome their weaknesses. Since I am an older runner, many young runners have told me they think, “if she can do it, I can as well”. If I have any advice, it is to go out and do whatever you dream about. Don’t say you will get to it later. I didn’t know that I could run until I started. I would never have been able to see and experience the remote, breathtaking places I have if I had not challenged myself. So please don’t be afraid. Try new things. And go wherever your passion takes you!